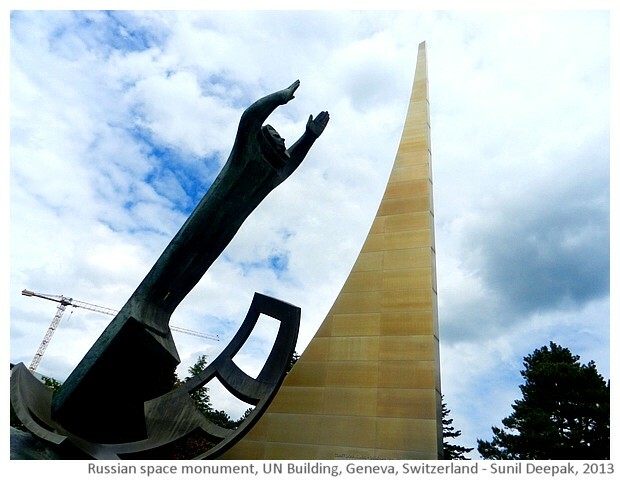 Geneva in Switzerland is home to many buildings of the United Nations. Over the past 20 years, in the course of my work, I had the opportunity to visit many of these buildings. 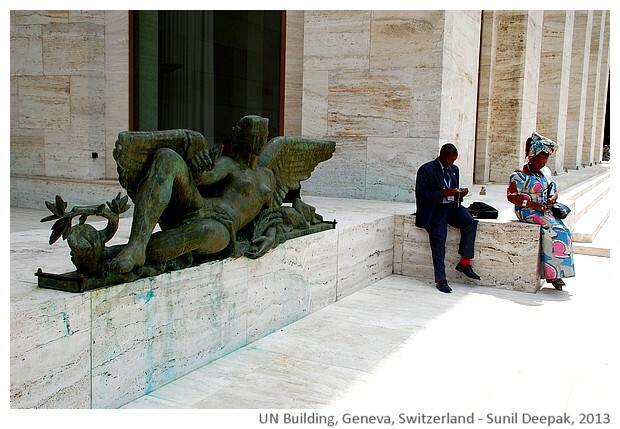 This photo-essay is about a walking tour to some of the important U.N. buildings. The United Nations were started as "The League of Nations" at the Paris Peace conference in 1919 following the First World War. Its aim was to promote world peace. 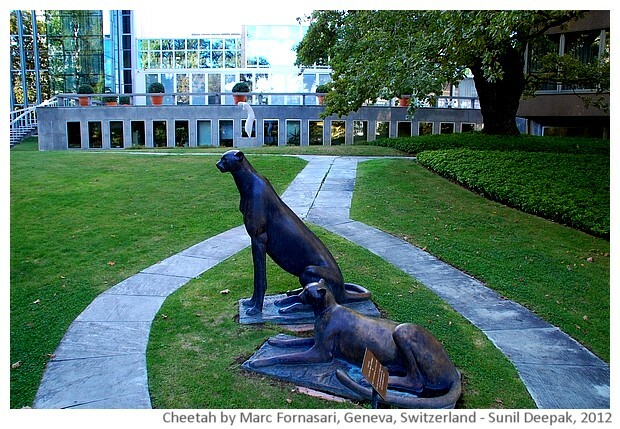 Palace of Nations building in Geneva was built in 1929-1936 to host the League of Nations. 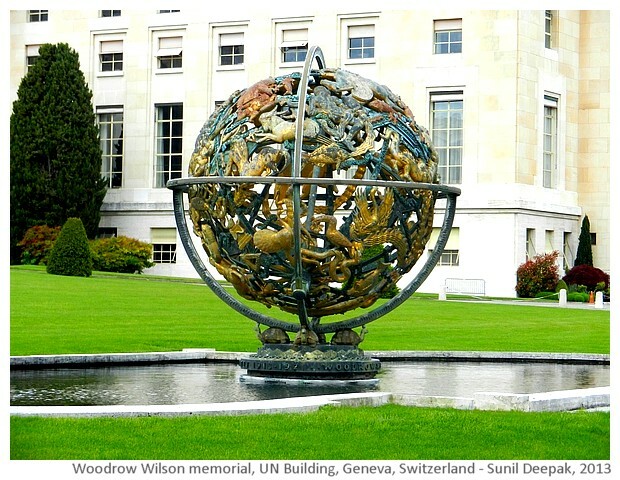 After the second world war, League of Nations was replaced by the United Nations with its main office in New York. United Nations have many specialized organisations such as - World Health Organisation (WHO), International Labour Organisation (ILO), United Nations Development Programme (UNDP), United Nations High Commission for Refugies (UNHCR), United Nations Human Rights Commission (UNHRC), United Nations Educational Scientific and Cultural Organisation (UNESCO) and United Nations International Children's Emergency Fund (UNICEF). 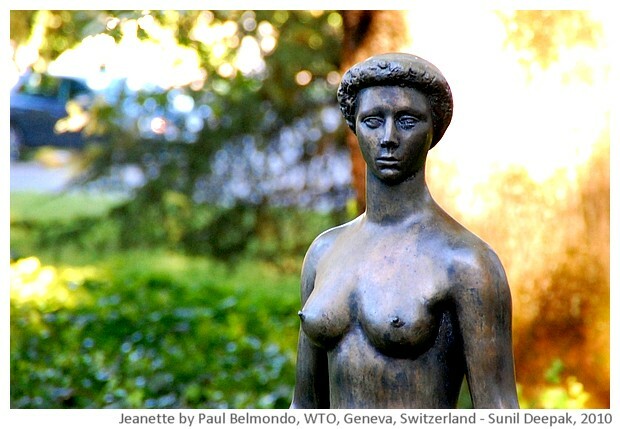 Many of these organisations (except for UNICEF and UNESCO) have their head offices in Geneva. Palace of Nations building hosts the general assemblies and meetings of some of these organisations. 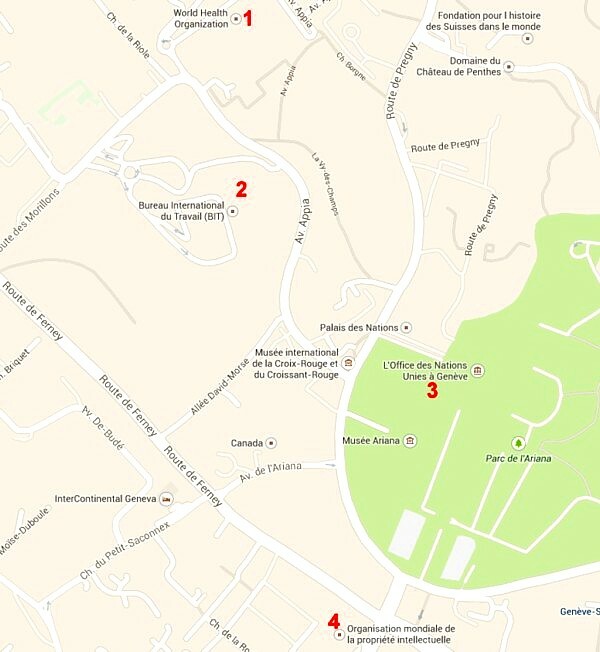 The map below shows 4 of the UN Buildings, that are part of this itinerary. 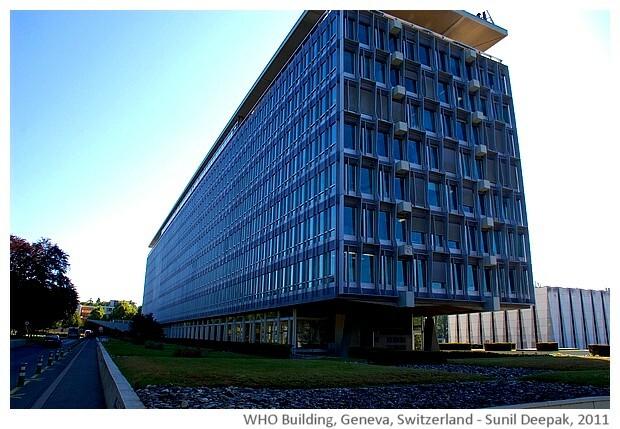 We start our tour at the the World Health Organisation (WHO) building, located at the top of a hill. Take bus number 8 from the railway station and its last stop is in front of the WHO building on Avenue Appia. Till the 1990s, it was easy to go inside the WHO building and move around. However, after the September 2001 terrorist attacks in the USA, they have more security checks now and you need to have an official invitation to enter WHO. 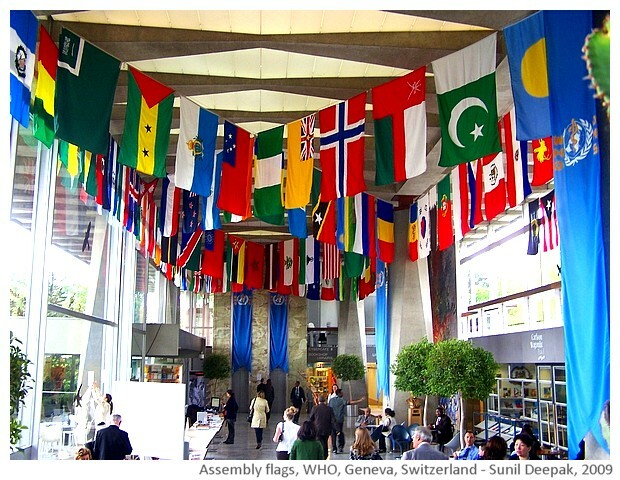 During the annual world health assembly when ministers of health gather in Geneva, the flags of all the member countries are displayed in the WHO lobby. Even if you can't enter WHO building, you can walk around and see. 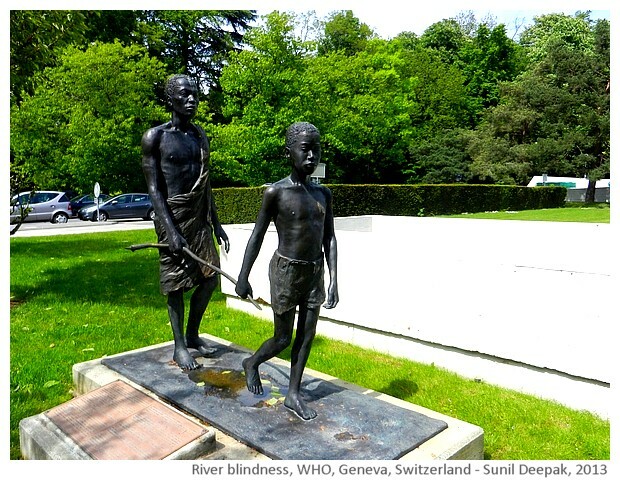 In front of the WHO building is the UNAIDS building, while the park in front of it has two groups of statues - the river blindness statues and the vaccination statues. The WHO building is number 1 on the map above. 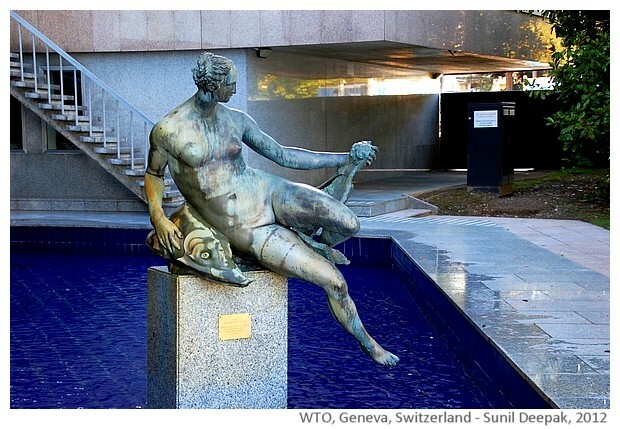 The International Labour Organisation (ILO) building is a short walk downhill from WHO. 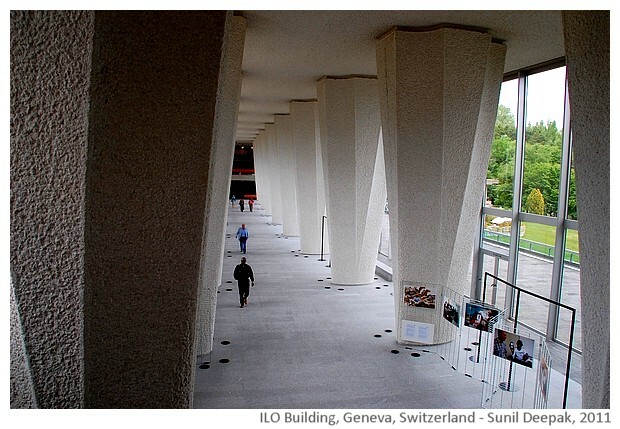 The ILO lobby has some huge columns that give it a monumental feeling - its architecture somehow reminds me of the Brazilian capital, Brasilia. It is number 2 on the map above. 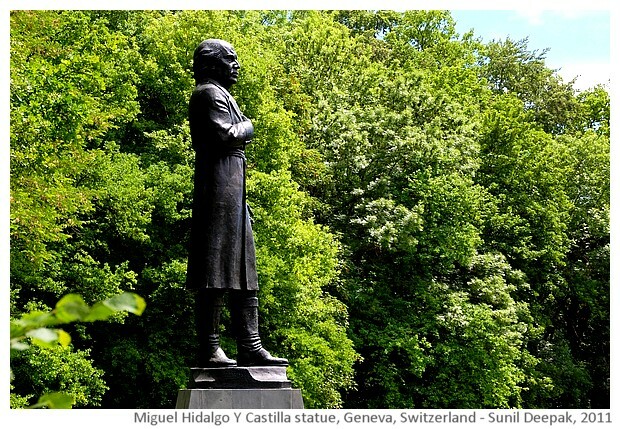 Across the road from the ILO building, in a grassy meadow, there is the statue of Miguel Hidalgo Y Castilla, who had led the fight for independence of Mexico from the Spanish colonial rule. From ILO to Palace of Nations (PoN), you can walk down the road that goes downhill in front of ILO or you can take the path behind the Miguel Hidalgo statue that will take you near the USA embassy and the International Red Cross museum. PoN is number 3 on the map. Palace of Nations has public tours so you can visit it as tourist. Go through the entrance on the left side of the gate and you need a valid identity document such as your passport to enter. 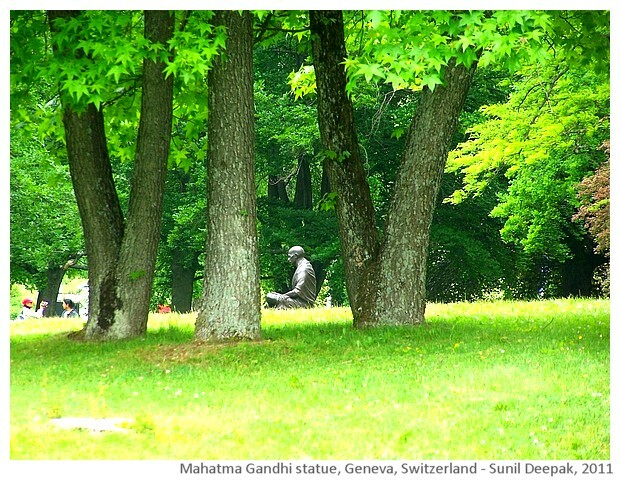 In the park outside the gates of PoN, you can see the Mahatma Gandhi statue. 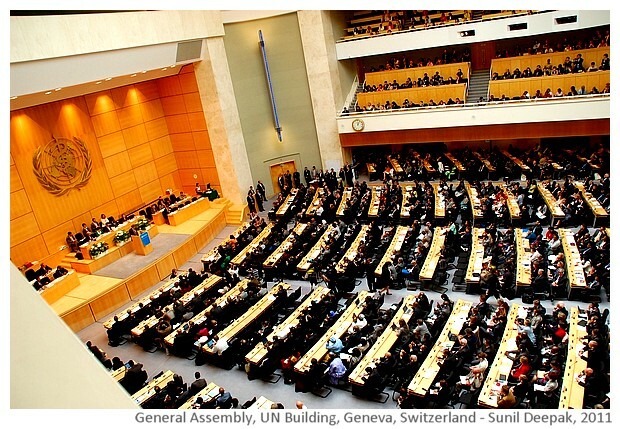 PoN has the general assembly hall where the different UN organisations hold their assemblies. 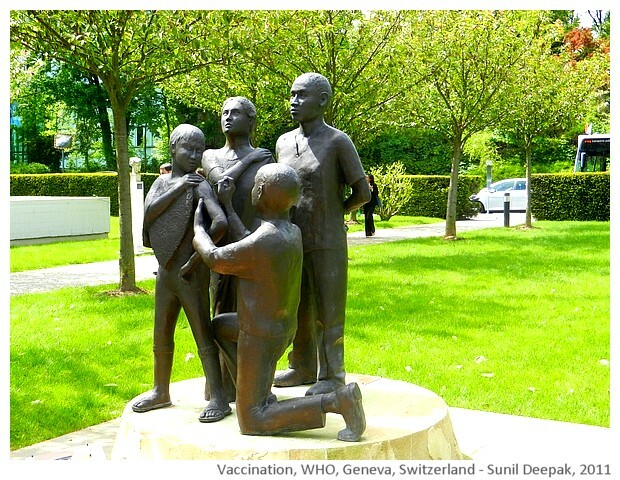 The image below is from May 2011 with Bill Gates speaking to the World Health assembly. Among all the guests that I have seen at the assembly, there have been many presidents and prime ministers, but my favourites were Amartaya Sen from India and Archbishop Desmond Tutu from South Africa. The main building has many places that make for good photo-opportunities. 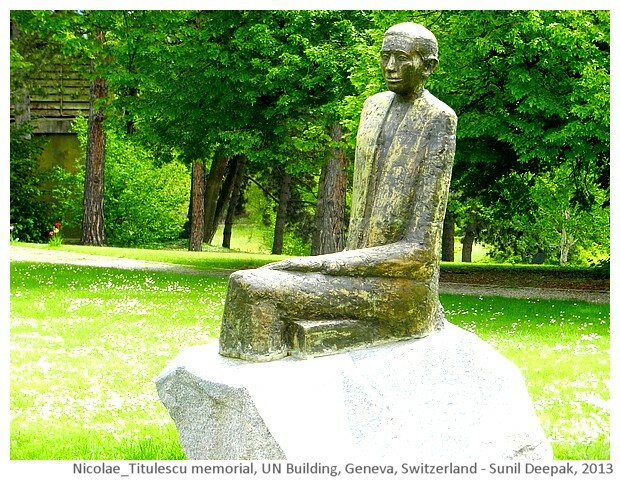 Do not forget to visit the back of the assembly building that has some wonderful trees, a nice view of the Geneva lake and some monuments as shown in the images below. Rather than walking around all the building to go to the back, an easy way is to go to the cafeteria on the basement level and then take the back exit. 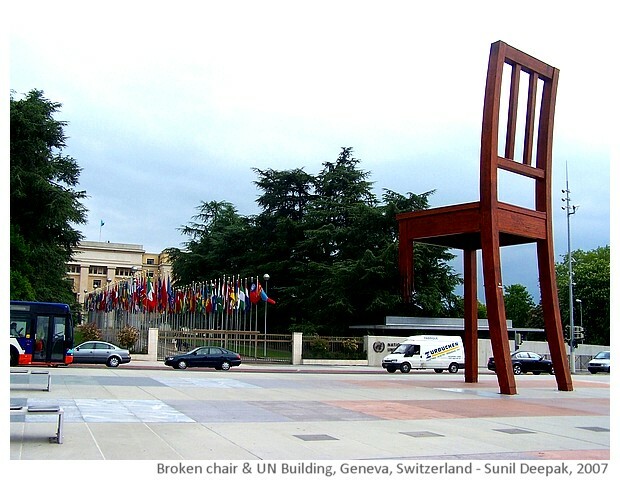 As you walk down from the PoN building, you will see the "Broken chair" of the anti-mines campaign and the fountains in the main square (first image on the top). Go on to the International Intellectual Property Rights (IIPR) building across the road on the right side. 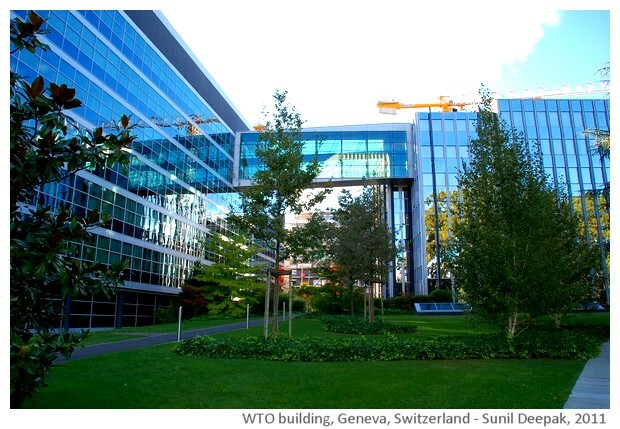 In the images, I have labelled it as WTO (World Trade Organisation) as in my mind patents for intellectual property rights are invariable linked with WTO issues, however these are two separate organisations, though probably they are inter-linked. I like the fountains and the sculptures in the gardens of this building. 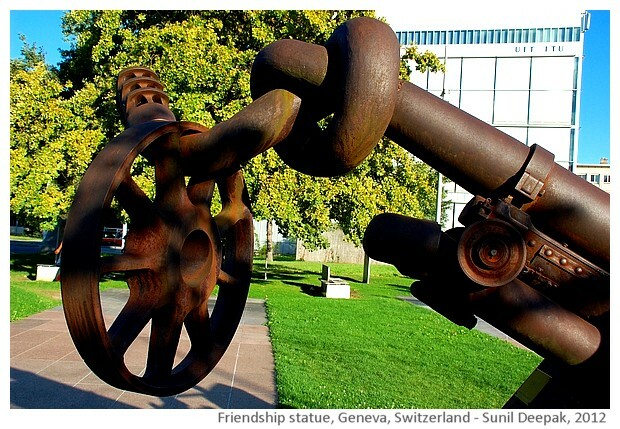 Across the road from IIPR, there is a park with some interesting sculptures, where you can rest. Further down the road, you can see the international workers' union building and international telecommunication organisation buildings. If you are not tired enough, you can continue. 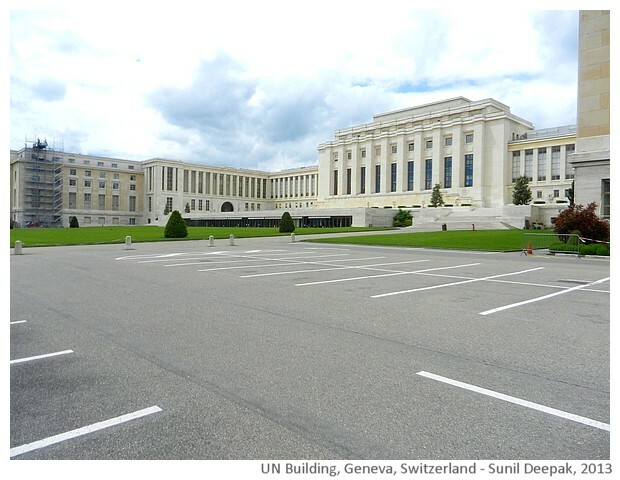 If you face PoN square and take the road going to your right, you will come across UNHCR building and then further down, main WTO building. 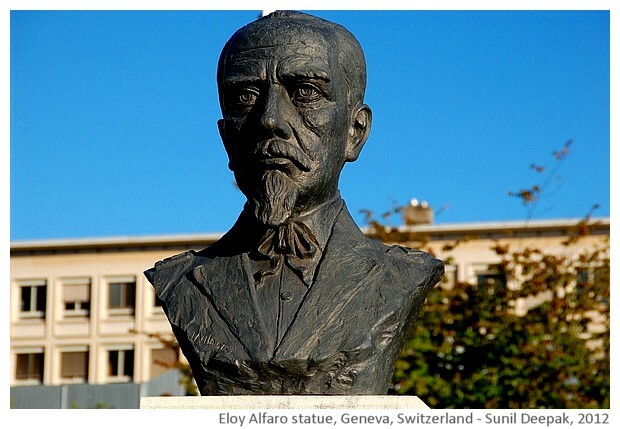 That will take you to the Geneva botanical gardens and the lakeside. I stop here today, that will be part of another walking tour!